80% cotton & 20% polyester. Machine washable. Available with straight hemmed 5cm finish. White or cream only. Very easy care , little ironing. 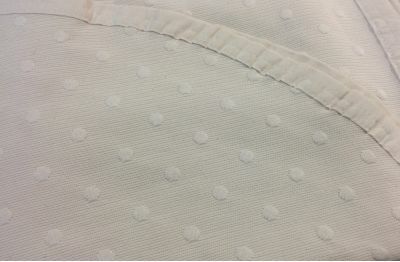 Lightweight bedspread .Ideal for Nursing homes, B and B s.Classical design of large dots modern, smart , lightweight fabric .Ideal for sofa throws.Other sizes available on request.